For other people named Raymond Cho, see Raymond Cho (disambiguation). Raymond Sung Joon Cho (Korean: 조성준) (born November 18, 1936) is a politician from Ontario who is currently serving as Minister of Seniors and Accessibility of Ontario since June 29, 2018. In 2016, he won a by-election to become the Progressive Conservative Party of Ontario MPP for Scarborough—Rouge River in the Ontario legislature. Previously, he had been a municipal politician since 1991, most recently as a City Councillor representing Ward 42 Scarborough—Rouge River. Before being elected, he worked as a social worker for the Catholic Children's Aid Society, the Toronto Board of Education, and the Scarborough Board of Education. Cho holds a master's degree in Social Work and Doctorate in Education from the University of Toronto. He is married to Soon Ok, and has three adult sons: Raymond Jr., Ronald, and William. He was first elected to Metropolitan Toronto Council for Scarborough-Malvern in 1991, and was re-elected in 1994. After the Scarborough and the other suburbs were amalgamated into the new City of Toronto, Cho was elected to the new council representing Scarborough-Malvern in 1997 along with Bas Balkissoon. In 2000, he was again re-elected, representing the new ward of Scarborough Rouge-River. He won re-election in 2003, 2006 and 2010. On August 13, 2004, the Toronto Star reported that Cho spent nearly all of his allotted councillor expense fund, one of the highest on city council. While there was some speculation that some of this money was diverted to Cho's failed bid to run in the federal election campaign, his executive assistant said the money was needed for newsletters mailed out to constituents to provide information on a rash of fatal shootings in the Malvern neighbourhood earlier in the year. Cho was Chairman of the Toronto Zoo for two successive terms. 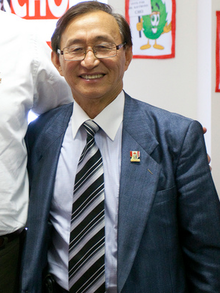 Cho was a New Democratic Party candidate for election to the House of Commons of Canada in the 1988 federal election and was initially identified as a New Democrat when he joined Metro Council, however, he soon became an ally and supporter of then Metropolitan Toronto Chairman Alan Tonks and dropped his NDP affiliation. He subsequently took out membership in the Liberal Party though, like most non-NDP municipal politicians in Ontario he did not run on a party label in municipal elections. He ran in the 2004 federal election as an independent candidate in Scarborough—Rouge River. Cho called himself an "independent Liberal", and used the Liberal Party of Canada's red-and-white colours for his campaign materials. He was accused of trying to mislead voters by the official Liberal candidate, Derek Lee. Lee, who has been the MP since 1988 said that Cho caused some controversy by claiming to have been shut out of the candidate nomination process. Lee won the election, Cho placed a distant second with 6,692 votes (17.8% of the total). In 2005, Cho expressed interest in being the Ontario Liberal Party's candidate in the Scarborough—Rouge River provincial by-election which was made necessary by the appointment of incumbent Liberal MPP Alvin Curling to a diplomatic position. However, the Liberal riding association used a clause of its constitution to declare another city councillor, Bas Balkissoon, as its candidate without a contested nomination process. Media reports suggested that this was done to exclude Cho as the provincial riding association was displeased with Cho's "independent Liberal" candidacy in the 2004 federal election. Cho was also mentioned as a potential candidate for the Progressive Conservatives since he helped former leader John Tory during the March 2005 by-election in Dufferin—Peel—Wellington—Grey. In the end, Cho chose not to run in the by-election which was won handily by Balkissoon. In 2012, Cho was named as the Progressive Conservative candidate for the provincial riding of Scarborough—Rouge River. In the 2014 provincial election, Cho placed third with 27.68% of the vote. In 2016, Cho was nominated as the Progressive Conservative Party candidate for the September 1 by-election in Scarborough—Rouge River, after incumbent Liberal MPP Bas Balkissoon resigned to spend more time with family. Cho won the by-election in an upset victory, becoming the first Korean-Canadian elected to the Ontario Legislature. Progressive Conservative pickup new district. ^ "About Raymond – Raymond Cho". ^ a b c "Raymond Cho - MPP, Scarborough-Rouge River". Ontario PC. Archived from the original on June 3, 2017. ^ Catherine Porter. Cho biggest spender at city hall; $53,100 limit nearly spent Councillor ran in federal election. Toronto Star. August 13, 2004. Pg. F02. ^ Ho Anderson. Rookies challenge Liberal MP. Toronto Star. June 19, 2004. Pg. H03. ^ Urquhart, Ian (October 5, 2005). "Liberals play rough on by-election. Toronto Star". pressreader.com. Toronto Star. ^ Robert Benzie. Twice bitten, McGuinty shy of vote; Curling's Scarborough riding considered a safe Liberal seat. Toronto Star. August 27, 2005. Pg F02. ^ Alcoba, Natalie (18 December 2012). "Rob Ford critic Raymond Cho named as Ontario PC candidate for Scarborough-Rouge River". National Post. ^ Benzie, Robert (September 1, 2016). "Tory Raymond Cho wins Scarborough-Rouge River byelection". Toronto Star. Archived from the original on June 3, 2017. ^ "Summary of Valid Votes Cast for each Candidate" (PDF). Elections Ontario. p. 8. Retrieved 20 January 2019. ^ "Valid Votes Cast for Each Candidate" (PDF). Elections Ontario. April 1, 2015. p. 11. Archived from the original (PDF) on December 6, 2015. ^ Ulli S. Watkiss (October 28, 2010). "2010 Clerk's Official Declaration of Election Results" (PDF). City of Toronto. p. 7. Archived from the original (PDF) on October 29, 2014. Party leaders listed first (in bold italics). Government members in bold denotes cabinet. This page was last edited on 23 January 2019, at 14:36 (UTC).